Craft and DIY lovers, be sure to take advantage of the Craftsy Mother’s Day Free Weekend Watchathon now through 5/13! From quilting and knitting to baking and photography, watch as many Craftsy classes as you want and experience the thrill of unlimited learning and inspiration, totally free! 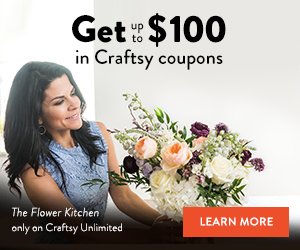 Save up to $100 on Craftsy Supplies with Coupons! Sign up for an annual subscription and receive $100 in coupons for supplies on Craftsy.com, plus free US shipping for one year. Today is National Puppy Day, and Daisy is almost 8 but we still think of her as our puppy dog! Most pet parents we know don’t need an excuse to spoil their fur kids, regardless of whether they are a puppy, adult or senior dog. There is one very special occasion that does deserves some extra celebrating and that’s your dog’s birthday or adoption day. Daisy is a rescue dog so we celebrate her adoption day, which many dog moms and dads call “Gotcha Day”. Whichever you choose to celebrate and/or call your dog’s special day, we wanted to clue you in to some very special gift ideas for your dog. Head on over HERE to check out all the dog toys, treats and gift ideas. Mamasource has this awesome Cyber Monday Special, today only, which is the perfect holiday bundle for your young explorer! Give your child a head start with a subscription to National Geographic Kids magazine plus the National Geographic Kids Almanac 2012! This magazine educates and entertains at the same time, so keep the kiddos busy as they read about wildlife, science and technology, history and archaeology, cultures around the world. Plus, you’ll get this exciting and educational almanac (a New York Times best-seller) which is packed with fun-to-browse features, useful reference material, homework help developed by educators, and the kind of quirky facts that kids adore. Don’t miss your chance to save big and help your kids develop a love and understanding of nature, animals and geography with this One Year Subscription and Kids Almanac for only $17 (or LESS if you have earned Mamasource Credits in the past)!